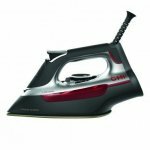 The Professional Clothing Iron is durable enough to withstand scratches, heats up quickly and provides an extra-smooth glide. Ironing is simpler than ever with a temperature dial that includes a fabric guide, adjustable steam control and an easy to grasp, comfortable handle. With over 300 steam holes, you can smooth out the toughest of wrinkles effortlessly. Features: CHI flat iron technology, titanium-infused ceramic soleplate, 10' cord, and a limited 2 year warranty.